Looking for an easier alternative to royal icing? 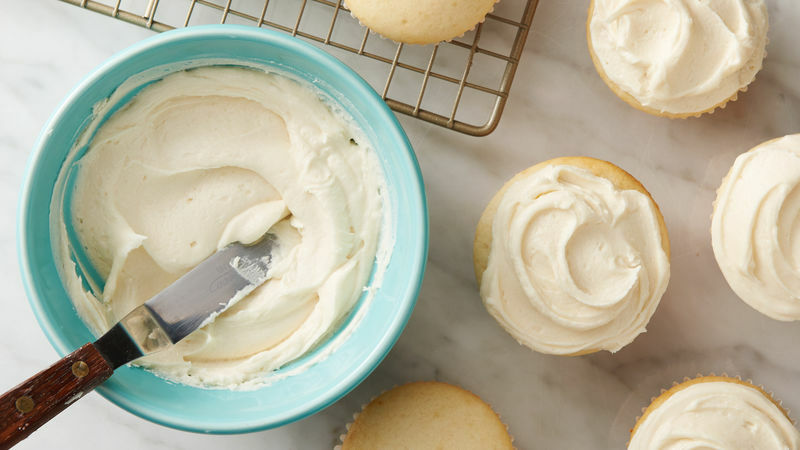 Smooth and spreadable, this foolproof vanilla buttercream recipe is ready quick and still gives your cookies an impressive (not to mention delicious!) finish. 1. First, gather your ingredients. 2. Next, mix the butter and powdered sugar in a medium bowl with a spoon or an electric mixer on low speed. 3. Stir in the vanilla and one tablespoon of milk. Once mixed, gradually beat in the remaining milk to make the frosting smooth and spreadable. If the frosting seems too thick, beat in additional milk a few drops at a time. If the frosting becomes too thin, beat in a small amount of powdered sugar. 4. If you want to color your frosting, stir in food coloring, one drop at a time, until you have the color you want. Divide your frosting into multiple bowls if you want make more than one color. When you’re done, learn how to frost your sugar cookies like a pro with our easy how-to. This frosting isn’t just for cookies! You can use it for other desserts like layered cakes and cupcakes.